Gorgeous eight bedroom six bathroom luxury pool villa. 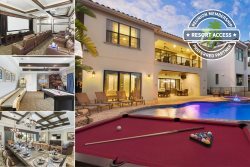 This amazing vacation home has everything you need for a perfect family holiday, with over 4,200 SQFT of space for you to enjoy. Dual hot water systems and dual air conditioning systems ensure that your stay will be a comfortable one. Unique to the Windsor at Westside resort, the highlight of this home is the greatly extended pool deck area where the whole family can relax, play and party in the pool and spa. Luxurious sun beds and a cool cabana area together with generous seating in the shade of the lanai when the Florida sun becomes too much. With a lake to the front and nature reserve to the rear side, this home is the perfect place to relax when taking a break from the theme parks. The home is perfectly located in the gated Windsor at Westside Resort, just miles away from the gates of Disney® and with easy access to all major roads in Orlando.